PRESIDENT DONALD TRUMP: It lasted a long time. We're glad it's over. It's 100% the way it should have been. I wish it could have gone a lot sooner, a lot quicker. There are a lot of people out there that have done some very, very evil things, very bad things. I would say treasonous things against our country and hopefully that people that have done such harm to our country......Those people will certainly be looked at. I've been looking at them for a long time and I'm saying why haven't they been looked at? They lied to Congress. Many of them, you know who they are, they've done so many evil things. I will tell you, I love this country. I love this country as much as I can love anything. My family, my country, my God, but what they did, it was a false narrative. It was a terrible thing. We can never let this happen to another president again. The attempted coup of President Trump only scratches the surface of the treason that was the Kenyanesian Usurpation. Treason - Yep, President Trump went there - as he should. Trump is now on offense. Great time to buy stock in rope. John Brennan, head spook and political meddler, attempted a coup in the USA. President Trump gets it. His time has come to really shine. I hope he finds justice we all have asked for. 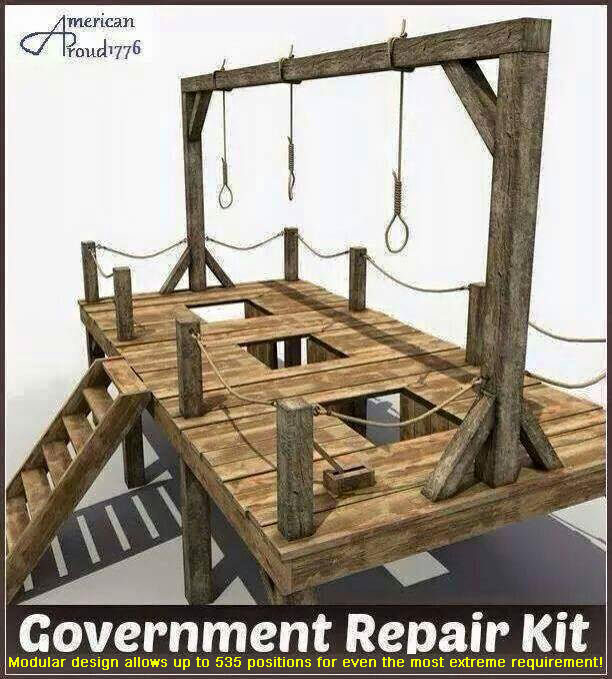 We'll know when accountability and justice have been served when Comey, Brennan, Clapper, Lynch, Hillary and so many other corrupt officials are in jail with large debts. I’m glad to hear it expressed with this level of seriousness. I could not agree more. This is an existential crisis for the US and it was driven by knowing acts of treason. Praise God and a big Thank-you to President Trump! Your perseverance makes us proud! Is he going to do something NOW about exposing the coup members? I hope so. They haven’t had time to regroup yet. I am stocking up on the pop corn! This is going to be awesome to watch! Go Mr. President! We got your back! This whole affair is far bigger than Watergate. Watergate was a bunch of inept political operatives trying to get dirt on their opponents and Nixon trying to cover up for them, This, on the other hand involves the weaponising of the FBI, Justice Department and CIA and the secret FISA courts, to unseat a duly elected President, by the opposition party. Now it's Trump's turn. " He who draws his sword against the prince needs to throw away his scabbard"
YES it was an F-ing witch hunt. The report is a joke. The coup was able to utterly hamstring him from his best efforts for two years. It was able to prevent most of his foreign policy goals. With political investigations and arrests, it was able to deliberately frighten away the quality cabinet level people and negotiators he planned to attract into his administration. He couldn’t fire feckless Sessions or Rosenstein without GOP threats to impeach. The entire time the investigation was actually conducting opposition research for 2020. So now, after confirming that the Russians “stole” the election for Hillary, but that they can’t “prove” that Trump knew, ALL of that data mining will be provided to the 2020 Dems. Yeah, it was a witch hunt, it’s main intent was to box Trump into about 40% of what he could have accomplished. Watergate was spitting on the sidewalk by comparison. The media would go berzerk. Works for me. Ill supply the round. .308 or 5.56. Yall should contact The Prez and encourage him to prosecute the Deep State evil-doers. Well for the love of all that is holy, GO AFTER THEM. That’s one of the reasons we elected him. Air them on Pay-Per-View and we can probably wipe out the national debt!